When Pantone named emerald green as their color of the year, we were thrilled. We are going to love seeing some of our brides incorporate this great jewel tone into their wedding color story! In honor of the up-coming St. Paddy’s Day holiday (when everyone’s blood runs a wee bit green) we thought we’d celebrate with some emerald aisle inspiration! Emerald is great because it can pair beautifully with other colors like peach or mint, but it also is gorgeous standing on it’s own with other neutral tones like black or navy. Don’t stress about hunting for the perfect emerald flower – there aren’t many actual flowers in that shade of green. Instead, focus on the darker green leaves of certain flowers or choose to incorporate non floral items like hypericum berries, cabbage, boxwood, succulents, moss or wheat grass. We love the concept of using white peonies because of the neutral tones of the white and the dark green peony leaves. Use emerald as an accent against a black and white or navy and white stripe for a bold statement. Keep the flowers all white, so your emerald accents pop. Think emerald glass containers for your candles or floral, emerald stemware or accent linens. 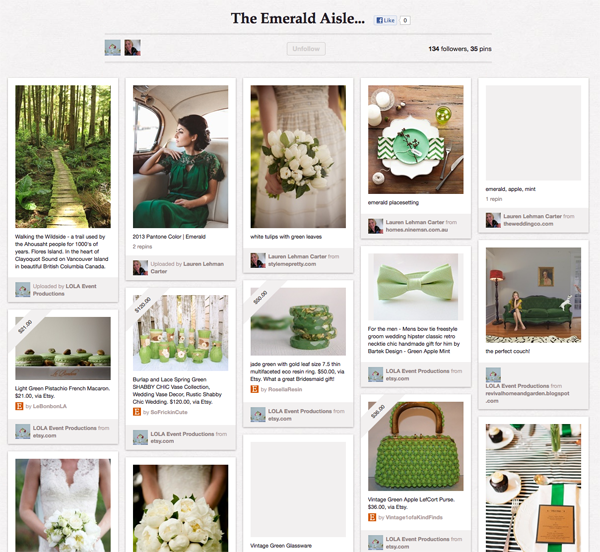 For details on these images and more emerald inspiration, visit our Emerald Aisle Pinterest board. Design Style Mash Up – Tips for Keeping Your Design Style Fresh and Focused!